The Metropolitan Museum of Art has partnered with the New York Film Academy for three years now. Our “Art and Film” workshop has proven to be an enormously successful collaboration. A unique joint venture between two world-class institutions, “Art and Film” affords students an extraordinarily rare and fruitful opportunity, as well as an active, deep learning experience. On site at the Met, students learn the basics of documentary filmmaking from top New York Film Academy instructors, led by Documentary Department Chair, Andrea Swift. 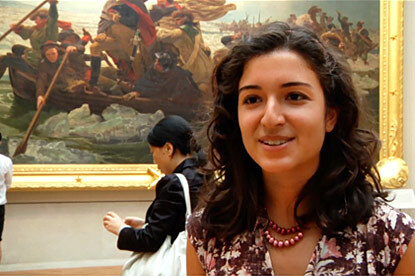 They begin to master these new skills by creating short documentaries about the Metropolitan Museum’s exceptional art. Each summer, Alice Schwarz, the Metropolitan Museum Educator in charge of Teen Programs, chooses specific galleries, pieces of art, or behind-the-scenes museum activities to teach the teens. Then, she and Ms. Swift collaborate to create a pedagogy and series of learning experiences through which the students develop and use their budding documentary skills to create collaborative 3-minute documentaries exploring Ms. Schwarz's chosen subjects. Ms. Schwarz engages them with the art by facilitating a unique opportunity to encounter it directly under her adept mentorship, as well as that of top Met Curators, Conservators, Designers, and any other staff members who may be helpful to the study. We began in the Summer of 2010. In three weeks, twelve teens with little or no experience in either Art or Filmmaking, made three accomplished films about the Museum’s Sculpture Garden, Arms and Armor gallery, and Oceania exhibit. It was exciting and satisfying to see their remarkably quick integration of documentary-making skills. But even more exciting was each student’s new knowledge, keen insight, deep interest, and real engagement with the art they filmed. The Metropolitan Museum and New York Film Academy were both so pleased with the results, that we immediately decided to do it again in the summer of 2011. For this workshop, twelve new teens journeyed through a very similar program, this time going “behind the scenes” at the museum. The students “won the lottery” and became the first group ever allowed to explore the inside secrets of how a major exhibition is mounted. They were guided by Ms. Schwarz and Helen C. Evans, the Met Curator widely considered the world’s leading expert on Byzantine Art; Conservator Pete Dandridge, also among the top conservators on the planet, and Michael Batista the ace designer chosen for the plum assignment of designing one of the most anticipated shows of the decade. Developed through filming, the students forged a new understanding and connection to both the Museum and Byzantine Art. 2012 brought yet another exciting rendition of “Art and Film.” As always, Alice Schwarz and the Met had another great learning objective up their sleeves. Twelve more uninitiated teens spent three intensive weeks of their summer learning to create documentaries about more of the Met Museum’s world-class art. And again, they were allowed to engage with the art in extraordinary ways. This time they made three distinct documentaries about the same iconic piece of art: “George Washington Crossing the Delaware.” Not only did the films show remarkable growth in their filmmaking abilities, these students unearthed new knowledge and rekindled interest in a painting that is so iconic. The variety of their films also created a surprising lesson: the same group of people can encounter the same art, learn the same lessons from the same world class Curator and Met Educator, and still make three entirely different movies!